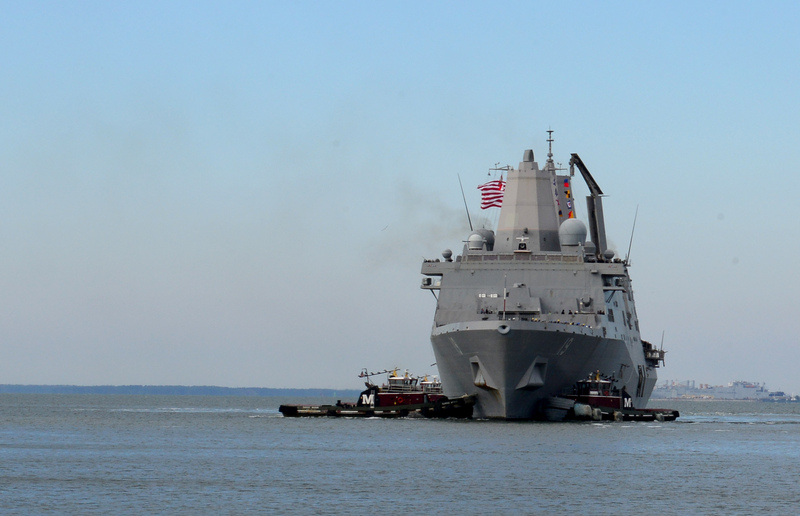 NORFOLK, VA — Early design work on the Navy’s next generation amphibious warship — based on the San Antonio-class (LPD-17) hull — has begun ahead of a planned 2020 procurement, Navy officials said on Wednesday. The design work for the LX(R) after a longer-than-usual back and forth on the analysis of alternatives (AOA) discussion for the future class of 11-ships with a request for proposal to industry due out in 2017, said Capt. Erik Ross with Office of the Chief of Naval Operations amphibious warfare division (OPNAV N95). The Navy’s effort to replace the aging Whidbey Island and Harpers Ferry 16,000-ton landing ship docks (LSD-41/49) is focused on driving cost out of the new class at the direction of the Navy’s chief shipbuilder, Sean Stackley, Assistant Secretary of the Navy for Research, Development & Acquisition (RDA), Ross said. “The whole reason the AoA was paused was for us to get smarter on cost estimates earlier,” Ross told reporters during NDIA’s Expeditionary Warfare Conference. The lead ship of a San Antonio derived LX(R) would cost about $1.64 billion with follow-ons costing about $1.4 billion for a total of 11 ships, according to information from the service. Last month the service decided to use the LPD-17 hull as the basis for LX(R), according to a memo signed by Secretary of the Navy Ray Mabus. That decision was largely based on the trend of the three ships that comprise the Navy and Marine Amphibious Ready Group/Marine Expeditionary Unit (ARG/MEU) operating more independently as disaggregated forces, Ross said. “One of the reasons that CNO leadership elected to go forward with a LX(R) that’s a LPD-17 derivative is the capacity, capability and flexibility and the ability go off with that aviation capability and command and control,” Ross said during a conference briefing. The capabilities to assist in more independent operations include a permanent hangar for aviation maintenance and better command and control systems than the current LSDs. “We want that capability [for LX(R)]. We don’t want the LSD capability — that was really just a truck to always be married up with ARG and never go away from it,” Marine Maj. Gen. Robert S. Walsh, Director Expeditionary Warfare Division (N95), told USNI News on Wednesday. Now the San Antonio hull has been selected as a template for the design, the service is now working to squeezing cost out of the LX(R) ship-class. “How can you get a lot of the great things you have in that LPD-17 hull form but at less cost,” Walsh said. Part of the effort will examine what level of military specification (MILSPEC) equipment will be included in the design, Ross said. “There’s a trade in terms of reliability, survivability and cost and then more efficiently buying things that are less expensive that can be placed in the right part of the ship in terms of design,” Ross said. As part of the effort, the Navy has been in consultation with the two shipyards most likely to compete for the LX(R) business — General Dynamics NASSCO and LPD-17 builder Huntington Ingalls Industries (HII), Walsh told USNI News. “Both HII and NASSCO were helping with ideas on how to drive cost down,” Walsh said. The service will now undertake the preliminary design review (PDR) and critical design review (CDR) for about the next two years, Walsh said. “We’re so far ahead of the game normally in where we’d be in a ship like this with all of the hard work really on the acquisition side,” he said.